This 1,600 sq ft rancher is located at the very back of the Springs and shares a rear fence with Sandbridge. There are 2 bedrooms, 2 full bathrooms. 10 ft vaulted ceiling in dining, living, kitchen and family room. A cozy gas fireplace in family room with sliders off the nook to a covered east facing patio. The master bedroom has a 5 pc ensuite with jacuzzi tub/shower combo, skylight and a walk-in closet. Some of the updates since 2006 include roof, vinyl windows, kitchen countertop, blinds, furnace, hot water tank. The oversized 19 x 21 garage can accommodate only one vehicle. 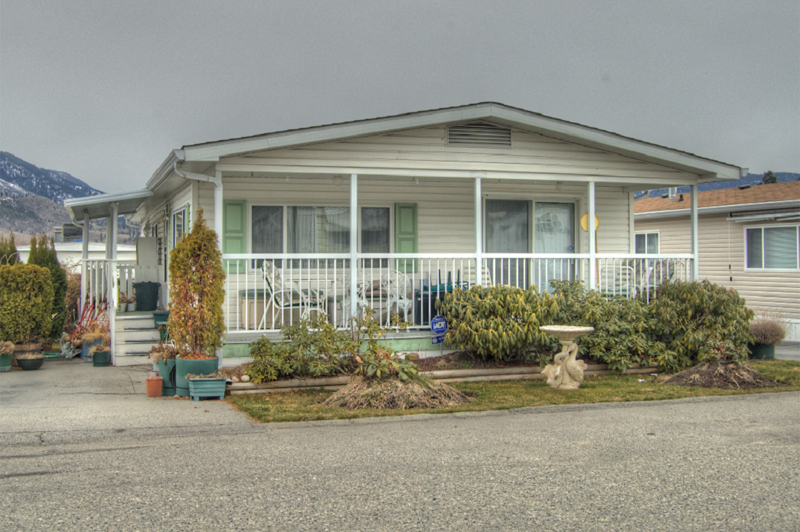 The Springs gated community offers a close proximity to shopping and to Skaha Beach & Park. Low strata fees of $60/month, age 55+, 1 dog (max 30 cm at shoulders) or cat on approval, and 6 rentals max allowed. All measurements and square footage is approximate and should be verified by the Buyer and their agent if important. Call Paul at 250-462-0558 TODAY for your private viewing! Visit www.SellsPenticton.com for more information and photos.